Hi, I have an old repaired crack that started to leak between floor and wall again. I would like to get an estimate on repairing the crack and possibly what exterior waterproofing would cost. Or if you have any other ideas. The wall in question is the the wall where all utilities are located. Our garage foundation is heaving during the winter and our garage floor has dropped in one corner. The problem looks very similar to some of the pictures on your website. We had a minor flood in the basement and think it's an issue with the foundation...we believe we need weatherproofing done on the outside. We are thinking the length of the back of the house needs to be dug up and have the weatherproofing done. Today 2/4/2019 I discovered that my basement is wet, I first found that there was water in the floor of our washroom in the basement. In one area of the basement, the carpet is wet and when I pulled the floor molding and poke my finger in, I can feel the water. My question is, do you charge for an inspection and for the quote? because I am planning to have a second opinion where I can compare and choose from. We have a leak in serveral location on our basement. I believe the water is coming through the tie rods in the concrete. Looking for an estimate on exterior waterproofing. You were professional, fast and very accommodating to my needs. I have never seen anything like this before, and you can be sure that I will recommend your company to anybody I know who needs this kind of work. "Matt was polite, very knowledgeable and very personable,..."
"The service and quality of repair was fantastic." "I was impressed by Ali's punctuality, kindness , great..."
The surfaces of this dirt crawl space were covered with the CleanSpace Vapor Barrier for superior protection against moisture. Many homeowners in the town of Newmarket commute into Toronto every day for work. While they're gone, they shouldn't have to worry about water filling their basement; and yet, with the moderate and consistent precipitation Newmarket receives year-round, basement water problems are a distinct possibility. Clarke Basement Systems is the premiere basement waterproofing company serving Newmarket and the rest of Ontario. In business since 2003, we are the area's trusted source for a dry, clean basement. Even if you don't think there's much moisture in your basement, it's best to get rid of it before mould or rot develops. Clarke Basement Systems offers a wide variety of products to ensure the safety and cleanliness of your basement. From sump pumps to drains and dehumidifiers, all of our patented, warrantied basement waterproofing products are designed to get a specific job done. Along with our basement waterproofing services, we also offer crawl space encapsulation and waterproofing to prevent discomfort and structural decay in this space. The key to a successful crawl space encapsulation is the proper installation of a moisture barrier, which seals the area from the world outside and prevents moisture from entering. This system has additional benefits as well, as it keeps out pests and can protect your home from fluctuating temperatures. Foundation repair is crucial for maintaining the safety and value of a home, and it must be completed by a professional contractor. Clarke Basement Systems has professional foundation specialists trained by Supportworks, the leading network of foundation contractors, ready to solve all of your property's problems. We will thoroughly inspect your property to produce a correct diagnosis of your needs. The way that these signs present themselves often makes the underlying problem very obvious. For example, stair-step cracking along exterior brickwork is usually a sign of foundation settlement, while upward-sloping cracks in the middle of floors can mean foundation heave. No matter what's wrong with your foundation, we have the products needed to restore stability to your home. Foundation piers, wall anchors and braces, and crawl space jacks are just some of the systems we can install on your property. 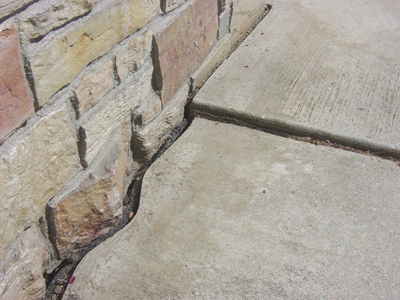 Big cracks in sidewalks like the one shown above are a sign of concrete slab settlement. If foundation settlement isn't your problem, concrete slab settlement might be. Have you noticed cracks or uneven floors along your driveway, sidewalk, patio, or garage? These are common signs of slab settlement, which detract from the attractiveness of your property and can cause tripping hazards. This is why we offer reliable concrete leveling, concrete crack repair, and concrete sealing solutions to combat these issues and to secure your home's image, safety, and value! Clarke Basement Systems uses PolyLevel for local concrete lifting needs. This system consists of a polyurethane foam which expands after it is injected beneath the concrete. Just 15 minutes after its installation, the slab will be lifted, level, and ready for normal use! We also use NexusPro as an effective concrete sealant for concrete cracks and joints. If you have cracked concrete steps, walkways, patios, and more, then NexusPro can effectively seal them while resisting UV rays, fluctuating temperatures, extreme weather patterns and more to assure their safety and image for years to come. After utilizing our concrete repair solutions, consider sealing your concrete with SealantPro. In just one quick application, SealantPro can extend your concrete's life by 3 to 5 times overall and guard against oil, gasoline, liquids, and other debris. Clarke Basement Systems offers free estimates for all of our basement, crawl space, foundation, concrete lifting, and concrete repair services. If you're concerned about the state of your home, we will schedule an appointment convenient to you. Contact us today for a free estimate in Newmarket! Harry D. noticed that his house foundation was leaking water into his basement, resulting in bad odours, forming mould and damage to stored items. Looking to resolve this problem, Harry contacted Clarke Basement Systems for a permanent fix. The solution for this wet basement included the use of our patented SuperSump® Premier Sump Pump System, UltraSump® Battery Back-Up System, WaterGuard® Below-Floor Drain and ThermalDry® Wall Membrane. These systems worked together to drain out incoming water and expel it away from the home while protecting the basement and contents stored, while simultaneously eliminating mould and musty odours. Thanks to the installation of these products, Harry D. does not have to think twice about a wet basement as it has protection from the best systems available. Clarke Basement Systems is pleased to have been able to assist this Newmarket, ON homeowner with ALL of his waterproofing needs. Keeping your basement dry is vital to prevent water damage and mold growth. Your basement is the perfect area for mold to form and later become airborne. Our customer in Newmarket, Ontario, badly needed several leaking cracks in their basement to be fixed. The water seepage had made the basement wet affecting our customer's peace of mind. Ben Wallis, System Design Specialist, spoke with the homeowner and provided a solution to eliminate their leaking crack issue. Ben suggested that a FlexiSpan Wall Crack Repair System be installed to permanently waterproof the crack. Foreman, Mark began the process by sealing the foundation with a polyurethane polymer to fully waterproof the foundation. Mark added a secondary drainage system to direct water into the Dry Well for extra protection. Our customer is pleased to have their basement protected, thanks to Clarke Basement Systems! Their peace of mind is at ease, and the home's value is no longer affected. The basement can now be used to store their personal items without the worry of water damage and mold. A home in Newmarket, Ontario, had problems throughout the finished basement. Water had been seeping up through the floor causing the house to smell musty. Mold was starting to form on the drywall and baseboards and the homeowner wanted to fix this issue before it go any worse. The customer called Clarke Basement Systems and Ben Wallis explained everything that would need to be done to the home. Luke Haverkort and the team came in and installed ThermalDry wall membrane on all the walls to keep moisture out and direct any seepage into the newly installed WaterGuard drainage system around the perimeter. This allowed the customer a piece of mind knowing their water issues are gone and the musty smell would disappear. Have mould on baseboards and wet floor after big rainfall last week. Please come by to quote work. Thank you. There is a little bit of water that seems to becoming from the corner of my basement. Need to get an estimate on one spot in my basement for hairline crack with water stain, please and thank you. I have a garage floor which needs leveling and would like a quote.